In order to add another block above or below an existing block, just click the "+" button on the upper or lower side of the block respectively. The "Add New Block" option contains all page blocks for Zipify Pages divided into categories so you can easily find any block you might need. The "Existing Block" option allows you to re-use blocks you've already customized/configured/styled for a page on any other page. Just use the "Choose Page" drop-down list to choose the desired page and then the "Choose Block" drop-down list to select the specific block you want to re-use. This feature allows you to save a lot of time, especially for blocks that you plan on using on every page (ie: header or footer). Once a block is added to your page, you can customize it as per your needs. Just hover your cursor over any block to have the control elements appear. Each editable block's element will have a blue frame around it and a blue pencil icon. To begin editing any block element, simply click on the element itself or the blue pencil icon. To hide the control elements, press the Esc key. Note: The available editing options for each element within a block varies depending on the type of element being edited. There's also the ability to edit the background of each individual block (the page's entire background can be edited from the left-side panel's "Page Settings" menu if desired). 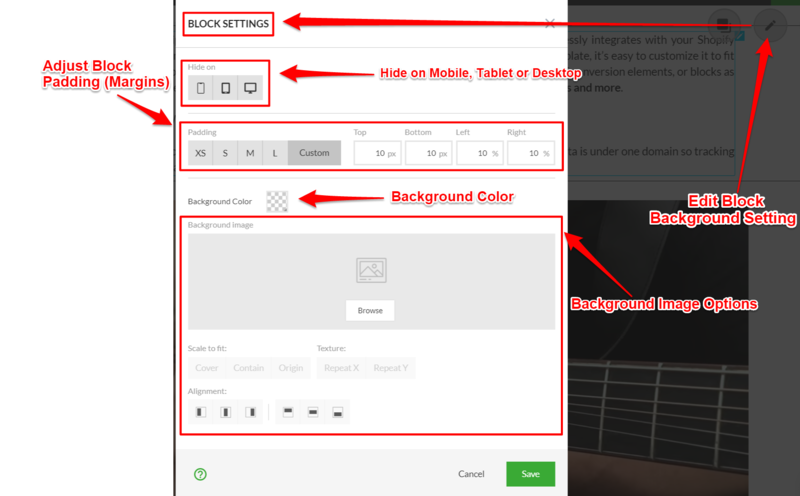 Click the grey pencil icon in the upper-right corner of the block's frame to open the "Block Settings" pop-up to edit the block background. Hide on: Hide any block on Desktop, Tablet or Mobile devices or a combination of any of those devices. Gives you the ability to create Desktop and Tablet/Mobile versions of your pages! Padding: Adjust the top/bottom padding of the block in pixels to provide more or less space between the block and the other block above or below. Adjust the left/right padding of the block in percentages relative to screen size. Left/right padding only works for Desktop and Tablet views of the page (doesn't work on Mobile due to lack of screen size). Background Color: Adjust the block's background color to any unique color desired by clicking the color swatch and then select your custom color. Upload background image: Upload a background image for a specific page block. Add a block background image by clicking the "Browse" button to upload the image from your computer. Scale to fit: Cover (enlarges the image and covers the whole block from top to bottom), Contain (contains the image to the block's height) and Origin (keeps the original formatting for the image). Alignment: Control the X and Y positions for the block's background image. Texture: Repeat X (repeats the image horizontally across the block) or Repeat Y (repeats the image vertically down the block). Note: Texture options are only available for the Contain and Origin image options. Once you're finished configuring the Block Settings, click the Save button to save your changes. Two Header blocks can be made "sticky" per page. Use one for the Mobile version of the page and one for the Desktop/Tablet version. Click the "Duplicate Block" button to quickly duplicate any block on the page. Click the "Trashcan" icon to delete the page block. This action is non-reversible so a pop-up will appear asking you to approve this action before the block is deleted. There's an ability to rearrange blocks up and down the page. Just place your mouse cursor over the "Drag" icon and click and hold your mouse's left-click button. Drag the block into the desired position and then release the mouse's left click button once you've moved the block into the desired position. Each block's element and block's background are equipped with an Undo/Redo feature. Use it to undo or redo up to 5 of your latest changes. Once you leave the Page Constructor for a particular page, the undo/redo cache will reset for the page. This means that you will not be able to undo/redo block edits from a previous Page Constructor session. NOTE: These controls stay gray-colored until you actually have something to Undo or Redo. Then they will become blue indicating that there is an undo or redo option available.